Following Chelsea FC’s magnificent victory in the 2016/17 Premier League, visitors to this year’s Automechanika Birmingham will have the opportunity to have their photo taken alongside the official Premier League trophy which will be appearing courtesy of Yokohama, the club’s official shirt partner. 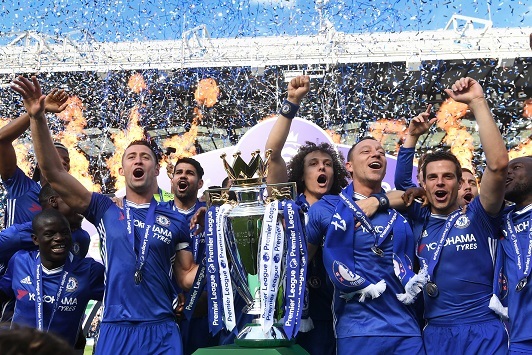 Chelsea lifted the Premier League trophy at Stamford Bridge after their recent 5-1 victory over Sunderland, making them the first club to take 30 top-flight victories in a 38-game season, as well as securing the club’s fifth Premier League title. As the trophy will be on display so soon after Chelsea’s victory, its presence is expected to attract scores of football fans to the Yokohama stand (20D80) who will be looking to admire the silverware and enjoy a memorable photo opportunity. With an overwhelming demand from other Chelsea functions, the trophy will only be on display during the first two days of the show, so fans are encouraged to visit the Yokohama stand early to avoid any disappointment. To find out more about Yokohama tyres please visit www.yokohama.co.uk. This entry was posted on Monday, June 05th, 2017 at 10:21 am and is filed under News You can follow any responses to this entry through the RSS 2.0 feed. You can leave a trackback from your own site.